Before buying pickles from the grocery store, consider making your own extra crisp kosher dill pickles. Making your own dill pickles is inexpensive and will save you money over the years. Homemade kosher dill pickles also make great gifts for friends and family members. Add your favorite spices and seasonings to the pickles to make them suit your tastes. Patience is required when making kosher dill pickles. Canning the pickles will not take a lot of time, but the pickling process will take two to three weeks. 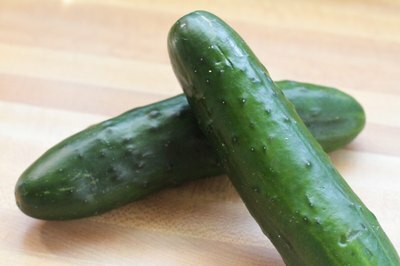 Choose firm and ripe pickling cucumbers. 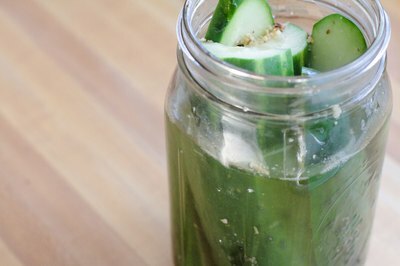 The cucumbers used for pickling need to have plenty of warts and they should be bright green in color. Wash the pickling cucumbers thoroughly. 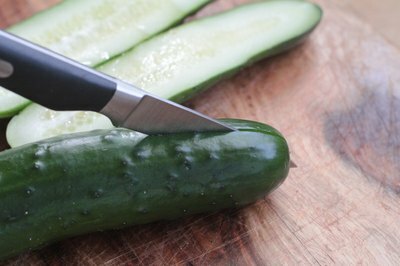 Remove any excess dirt and debris from the cucumbers, and lay them on a paper towel to dry. Decide to leave your pickles whole or cut them into halves. 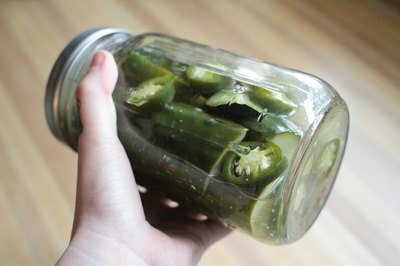 Depending on how large your canning jars are, it may be necessary to cut the cucumbers lengthwise. Do this step before preparing the pickling solution so that the cucumbers are ready to be soaked in the brine solution. Add the vinegar, water, salt and pickling spices to a large pot. Bring the brine solution to a rapid boil. Place the remaining ingredients in the canning jars. Add one large, peeled garlic clove, one chopped jalapeno chili, one bay leaf, one head of fresh dill weed and one grape leaf. The grape leaves are what makes the dill pickles extra crisp. Pack the pickling cucumbers into the jars. 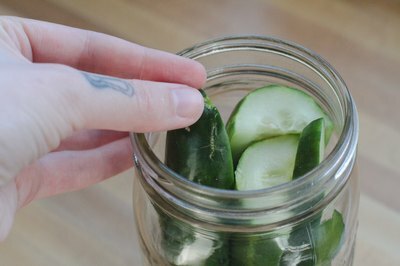 Do not force the cucumbers into the jar, but ensure that they fit tightly into each jar. Pour the brine into the sterilized pickling jars. 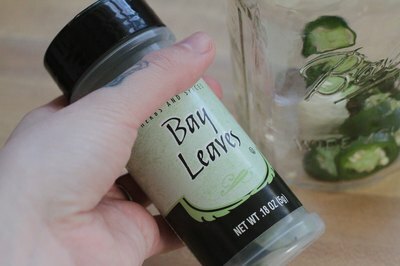 Fill the jars with the brine, leaving only 1/2 inch of space at the top. Place the canning jar lids on the jars. 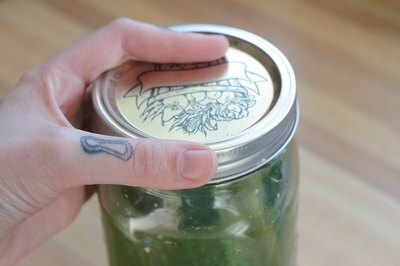 Secure them with the canning jar rings. Shake the jars to remove any leftover spices. Sit the kosher dill pickles out of sunlight in a cool and dry environment. Let the pickles ferment for at least seven days. Taste the dill pickles after seven days have passed. Continue to pickle them for another 7 days until they reach your desired tastes. Refrigerate the pickles after opening. 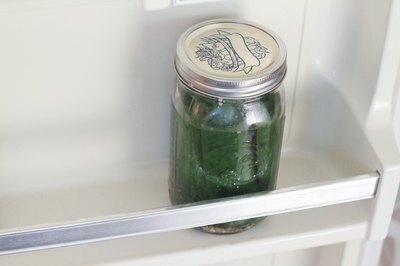 Sterilize canning jars by placing them in your dishwasher and washing. If you want to store the pickles for two years, seal the jars in a pot of water. 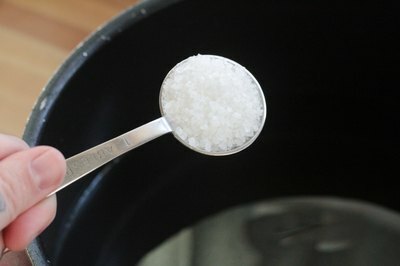 Set the jars vertically in a large pot of boiling water. Once you hear the lids make a “popping” noise, they are sealed. Store them in a dark and dry environment such as your basement or cellar.